extend deadline for taxpayers in the area of Transfer Pricing for FY 2017 and 2018. 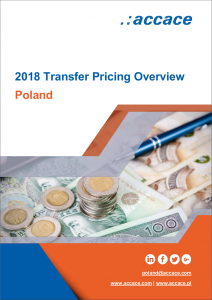 As an OECD Member State and an EU Member State, Poland adheres to the OECD Transfer Pricing Guidelines, especially OECD Report on counteracting BEPS (“Base Erosion and Profit Shifting”), in particular action 13: “Re-examine transfer pricing documentation” and to the EU Code of Conduct on Transfer Pricing documentation for associated enterprises. The capital threshold to qualify as a related party is 25%. Thus, transactions between entities holding less than 25% shares (directly or indirectly) will not be covered by documentation obligation. Moreover, starting 2017 the transfer pricing rules apply also to partnerships and consortiums between related parties. A three-level concept of the transfer pricing documentation was introduced. Under this concept, the taxpayer is obliged to prepare the documentation depending on the revenues and expenses disclosed in the books for the previous year. Represents local documentation containing details of transactions or other events between the Polish company and other group companies disclosed in the accounting books. The tax payer is obliged to prepare it if revenues or expenses exceed EUR 2 mln; however, if revenues or expenses exceed EUR 10 mln, the local file has to be supplemented with a benchmarking study (covering Polish comparable data). the source documents (i.e. contracts). The master file contains group level information. The tax payer is obliged to prepare it if revenues or expenses exceed EUR 20 mln. description of any agreements concerning income taxes made between the group components and the tax authorities in other countries (including unilateral APAs). The report on global allocation of income and tax within the group (required for groups in which the parent company consolidating the accounts is located in Poland). This document has to be filed by the holding company and if consolidated revenues exceed EUR 750 mln. It should be mentioned that the taxpayers obliged to prepare the TP documentation whose income/costs exceed the equivalent of EUR 10 mln in a tax year should enclose a simplified statement on transactions and other dealings with associated enterprises or on payments made in connection with such dealings (directly or indirectly) domiciled / seated or the management board of which is located in the territory or in a country applying harmful tax competition to the annual tax return. The statements shall be prepared on special CIT-TP or PIT-TP forms and shall include detailed data concerning the amount of individual transactions with affiliates. The new regulation includes broader information obligations upon a taxpayer, connected with intercompany transactions, including justification for prices in intercompany settlements. Above-mentioned regulation provides for the elements of: (i) a local file, (ii) a master file, and (iii) a benchmark study. transactions where the price results directly from legal regulations. The values expressed in EUR are converted to PLN at the average exchange rate published by the National Bank of Poland for the last working day of the tax year preceding the tax year for which the documentation is prepared. The Decree of the Minister of Economic Development and Finance of 12 September 2017 on the detailed scope of data to be included in the TP documentation. The standard methods are preferred over others. When the transfer price is determined by the tax authorities, the CUP method is applied in the first instance. If a taxpayer has determined the arm’s length value of a transaction by applying one of the three standard methods (CUP, Resale Price and Profit Split) and there is no doubt about the objectivity in choosing the method, this method is also binding for the tax authorities. attaching to the tax return for the fiscal year a simplified transfer pricing statement (PIT-TP or CIT-TP form). expire in 2019 for transfer pricing documentation, the statement and simplified transfer pricing statement (PIT-TP or CIT-TP form) for the previous fiscal year, i.e. 2018 if the fiscal year corresponds to the calendar year. As regards taxpayers obliged to prepare transfer pricing documentation for both 2017 and 2018, the deadlines will be extended with respect to obligations concerning both periods. Based on the new regulations, the extended deadlines apply also to taxpayers whose fiscal year does not correspond to the calendar year (e.g. the fiscal year of 2017 began on April 1st, 2017 and ends March 31st, 2018 or began on July 1st, 2017 and ends on June 30th, 2018). In case of benchmarking study, the analysis should be updated at least once every 3 years (if the business circumstances change in a way affecting the analysis the benchmarking analysis should be reviewed earlier). Moreover, according to the actual regulations, the tax authorities may request the taxpayer to prepare documentation in respect of transactions / events even if the value does not exceed the limits, provided that the circumstances suggest that their value could have been underreported in order to avoid the documentation obligation. In that case, Transfer Pricing documentation should be submitted within 30 days of the request. Despite the above, taxpayers are still obliged to present complete Transfer Pricing documentation within 7 days of the tax authorities’ request. Regardless of the limits, taxpayers will be obliged to prepare documentation also for the tax year following the year for which they were obliged to prepare the documentation. Decree of the Minister of Finance from 15 March 2018 extending the deadlines for the fulfilment of certain obligations related to transfer pricing documentation. In case the member of the group does not receive all required information about the group from the parent company, said information is presented based on the knowledge of the party or information obtained for this purpose (this fact should be disclosed in the CbCR file). The CbCR file must be filed for the first time within 12 months from the end of the group’s reporting year (for years started after December 31st, 2015). indicate the entity obliged to file CbCR together with its identity and tax residence. The notification should be filed before the end of the group’s reporting year. The new regulation indicates what information should be included in the information about a group of entities. The tax regulations provide fines for failure to fulfil the aforementioned obligations (maximum amount: PLN 1 mln). The Decree of the Minister of Economic Development and Finance of 13 June 2017 on the detailed scope of data to be included in the information about a group of entities. Currently, the APA is up to the Head of National Fiscal Administration (KAS) decision, which is a confirmation of the selection and application of a method for determining transaction prices between related parties. The main advantage of such decision is elimination of the risk of the tax authorities challenging the pricing mechanism applied in the given transaction (assuming that the taxpayer complied with the APA provisions) and protection from penal and fiscal sanctions for individuals responsible for tax settlements. Renewal fees are half of the amount of the fee for the renewed APA. If the taxpayer does not submit Transfer Pricing documentation at the request of the Polish tax authorities, a 50% penalty tax rate is applied for income assessed by these authorities. Moreover, the taxpayer will be required to pay interest on tax arrears and fiscal penalties resulting from personal responsibility. Contact our experts in Poland!